Working with generalized linear mixed models (GLMM) and linear mixed models (LMM) has become increasingly easy with advances in the lme4 package. As we have found ourselves using these models more and more within our work, we, the authors, have developed a set of tools for simplifying and speeding up common tasks for interacting with merMod objects from lme4. This package provides those tools. Fixed bug in REimpact where some column names in newdata would prevent the prediction intervals from being computed correctly. Users will now be warned. See NEWS.md for more details. On the first tab, the function presents the prediction intervals for the data selected by user which are calculated using the predictInterval function within the package. This function calculates prediction intervals quickly by sampling from the simulated distribution of the fixed effect and random effect terms and combining these simulated estimates to produce a distribution of predictions for each observation. This allows prediction intervals to be generated from very large models where the use of bootMer would not be feasible computationally. On the next tab the distribution of the fixed effect and group-level effects is depicted on confidence interval plots. These are useful for diagnostics and provide a way to inspect the relative magnitudes of various parameters. This tab makes use of four related functions in merTools: FEsim, plotFEsim, REsim and plotREsim which are available to be used on their own as well. On the third tab are some convenient ways to show the influence or magnitude of effects by leveraging the power of predictInterval. For each case, up to 12, in the selected data type, the user can view the impact of changing either one of the fixed effect or one of the grouping level terms. 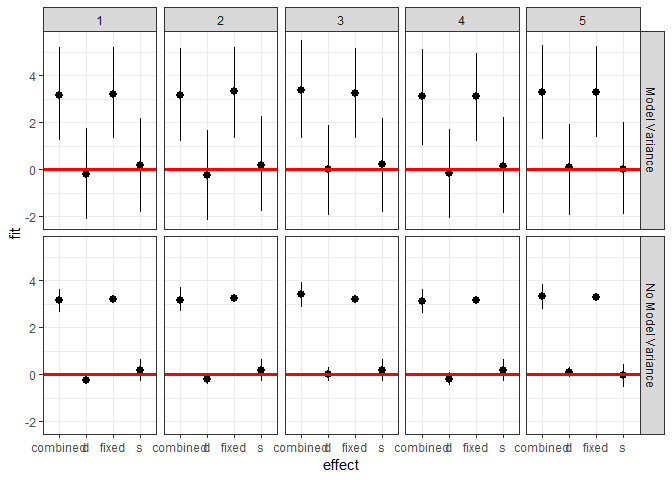 Using the REimpact function, each case is simulated with the model’s prediction if all else was held equal, but the observation was moved through the distribution of the fixed effect or the random effect term. This is plotted on the scale of the dependent variable, which allows the user to compare the magnitude of effects across variables, and also between models on the same data. Standard prediction looks like so. Note that predictInterval is slower because it is computing simulations. It can also return all of the simulated yhat values as an attribute to the predict object itself. predictInterval uses the sim function from the arm package heavily to draw the distributions of the parameters of the model. It then combines these simulated values to create a distribution of the yhat for each observation. 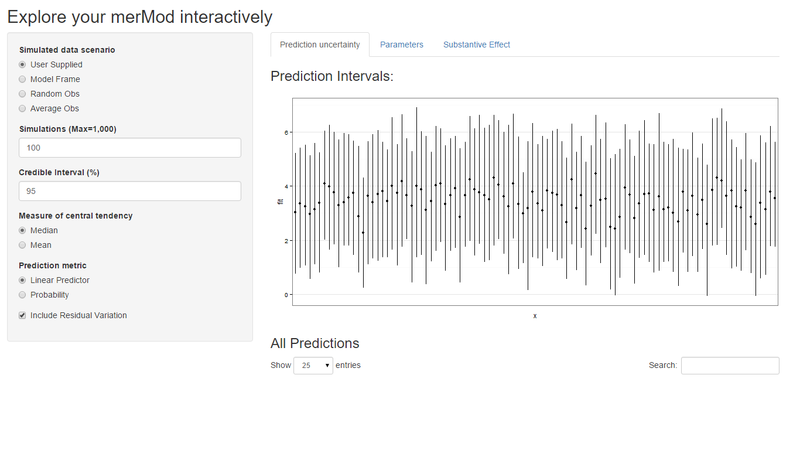 We can also explore the components of the prediction interval by asking predictInterval to return specific components of the prediction interval. We can also investigate the makeup of the prediction for each observation. merTools also provides functionality for inspecting merMod objects visually. 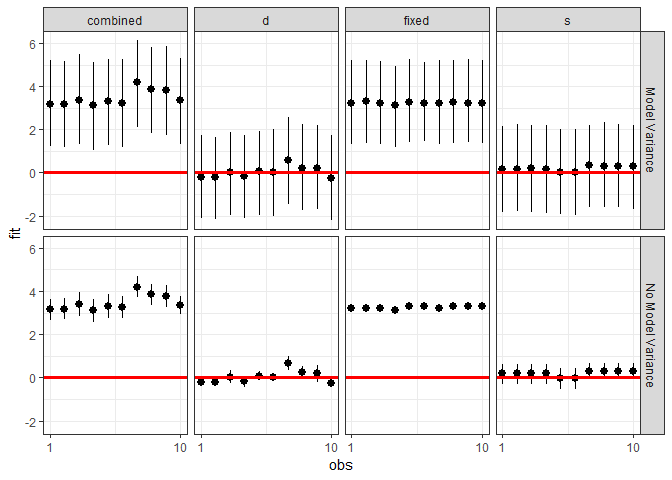 The easiest are getting the posterior distributions of both fixed and random effect parameters. Note that plotREsim highlights group levels that have a simulated distribution that does not overlap 0 – these appear darker. 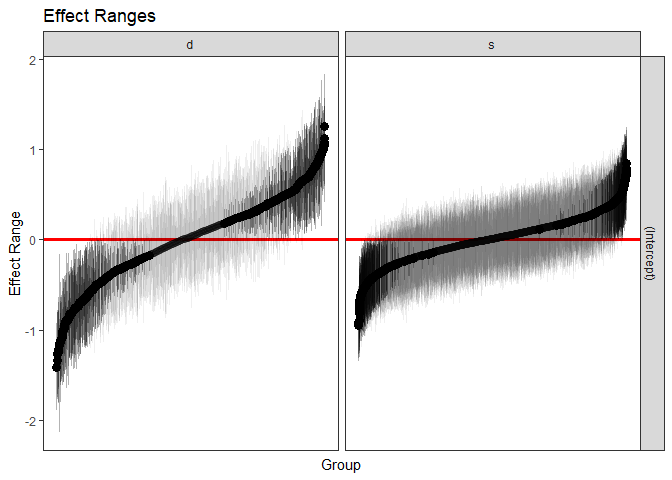 The lighter bars represent grouping levels that are not distinguishable from 0 in the data. Sometimes the random effects can be hard to interpret and not all of them are meaningfully different from zero. 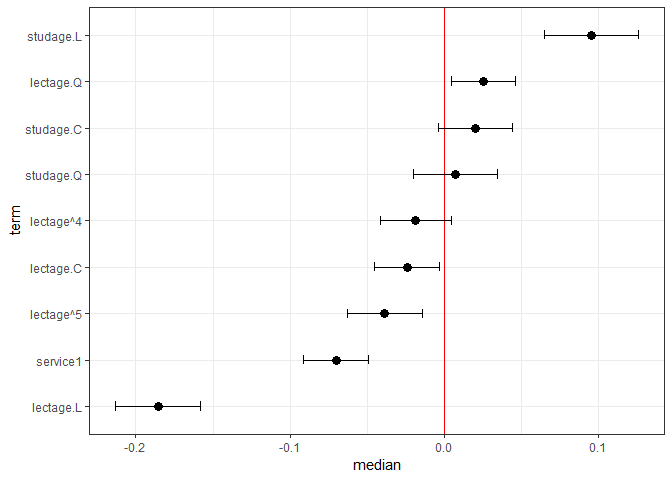 To help with this merTools provides the expectedRank function, which provides the percentile ranks for the observed groups in the random effect distribution taking into account both the magnitude and uncertainty of the estimated effect for each group. It can still be difficult to interpret the results of LMM and GLMM models, especially the relative influence of varying parameters on the predicted outcome. This is where the REimpact and the wiggle functions in merTools can be handy. 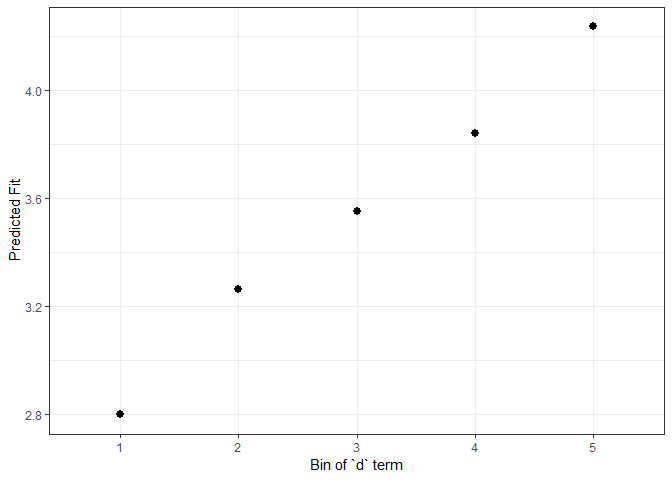 Here the standard error is a bit different – it is the weighted standard error of the mean effect within the bin. It does not take into account the variability within the effects of each observation in the bin – accounting for this variation will be a future addition to merTools. Another feature of merTools is the ability to easily generate hypothetical scenarios to explore the predicted outcomes of a merMod object and understand what the model is saying in terms of the outcome variable. Now we prep the data using the draw function in merTools. Here we draw the average observation from the model frame. We then wiggle the data by expanding the dataframe to include the same observation repeated but with different values of the variable specified by the var parameter. 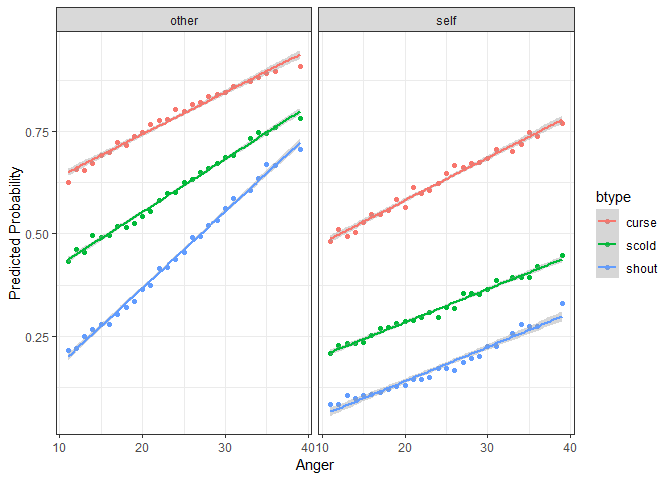 Here, we expand the dataset to all values of btype, situ, and Anger subsequently. The next step is familiar – we simply pass this new dataset to predictInterval in order to generate predictions for these counterfactuals. 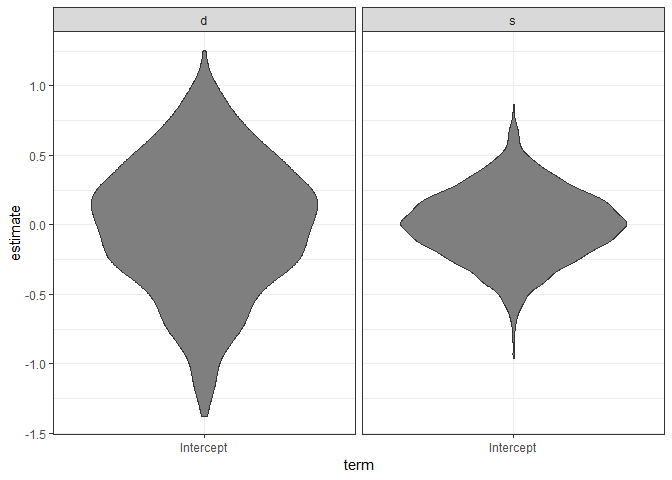 Then we plot the predicted values against the continuous variable, Anger, and facet and group on the two categorical variables situ and btype respectively.